The statistics about teenage drivers are startling. It's estimated that while teenagers only make up 10 percent of the total US population, they are involved in 12 percent of all fatal motor vehicle collisions every year. The skilled team of auto accident attorneys at Gary A. Zucker & Associates, P.C. 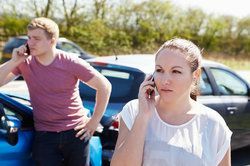 know these fact all too well, which is why we take accidents involving teenage motorists very seriously whether they occur in Brooklyn or elsewhere in the greater New York City area. Many people wonder why teenager drivers are involved in so many auto accidents every year, both fatal or non-fatal. We want to look at a few of the reasons why right now. The added sense of freedom that teens feel behind the wheel can be taken to dangerous extremes. Teens are more prone to reckless behavior on the road, such as speeding, racing, and tailgating. All of these actions make the roads more dangerous for other motorists as well as bicyclists and pedestrians. Even though the legal drinking age is 21, an estimated 32 percent of underage drivers who were killed in auto accidents in 2011 had alcohol in their systems. Further numbers reveal that roughly 26 percent of these teens in fatal accidents had BACs greater than .08, which is the legal limit for of-age drivers. Cell phone use while driving is a deadly source of distraction, and texting in particular can increase the likelihood of an accident by up to 23 times. The use of smart phones, tablets, and other mobile devices while behind the wheel is illegal in New York precisely because of this danger. While we've focused mostly on recklessness and bad behaviors of teenage motorists, we also need to acknowledge that driver inexperience can lead to major injuries and accidents. It can take a few years behind the wheel to truly understand how to deal with reckless motorists and certain kinds of hazards, such as debris in the road and bad weather. Young drivers may not be knowledgeable enough to make smart choices as these issues arise, and their inexperience can lead to an accident. If you are a young motorist or if you are the parent of a teen who has just received his or her license, remember that you share the road with others and that you need to drive responsibly. So many serious injuries and deaths can be avoided if people follow the rules of the road and drive attentively and cautiously. You should never take auto accidents lightly as they can have major repercussions that can last a lifetime. If you or someone that you love has been involved in an auto accident, be sure to contact our personal injury law firm today. During a legal consultation, we will be sure to discuss all of these matters in greater detail, helping you receive just compensation for injuries and losses.